A water softener uses a medium of special resin which serves to exchange "ions" of calcium and magnesium with sodium and potassium. The water in the house runs through a resin bed of small plastic beads or zeolite. The beads are covered with sodium or potassium ions. As the water flows past the ions, they swap places with the calcium and magnesium ions. Eventually, the beads contain nothing but calcium and magnesium, and softening stops. It is then time to regenerate the beads or zeolite. The beads regain their sodium or potassium ions by being flooded with a salty, brine solution that is rich in sodium or potassium. All the calcium and magnesium, dirt and sediments are flushed from the beads and into the drain this is called backwash. Finally the mineral tank is rinsed with fresh water and loads the brine tank so it's ready for the next cycle. A water softener reduces water hardness, making it easier to shower and clean fabrics and dishes. With softened water, less soap is needed for bathing and laundry. Skin feels cleaner and clothing softer. Pipes, fixtures and appliances have less scale build-up. With less build-up, appliances can operate efficiently. Mineral-derived odors may be reduced; and, there are fewer deposit stains on bathroom fixtures. The Canadian assembled Purifiner PDS Water Softener can soften your water and remove calcium with minimal maintenance. All PDS Series water softeners come equiped with automatic backwashing Erie rotary heads which can be customized to each individual's needs. 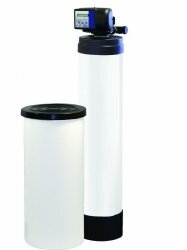 These water softeners are plug and play and do not contain filters or screens that need to be cleaned or replaced and this added convenience can save you time and money. These Water Softeners are also capable of taking out a small amount of iron with ease. The PDS Water Softeners use only the highest quality resin. Our water softners contain a bed of the Carbochem CA-12 Water Softener Excahnge Resin with 10% cross linked resin. This high quality resin lasts longer than the standard resin used in the majority of water softeners on the market. Additionally, this resin is more resistant to the harsher chemicals being put into the water in some municipalities. This is beneficial for areas such as Peel Region and York Region where Amonia is currently being put into the water. Aquapura Water Products also carries mixed bed water softners that can do more than one job. Our Purifiner PDS-MB Water Softener/ Carbon Bed Softens your water and filters out chlorine, bad tastes and odours through the addition of activated carbon in the bed. The mixed bed water softeners are a great solution for those expereincing hard water on municipal water sources or those on well water/ lake water sources who wish to get rid of bad tastes and odours.